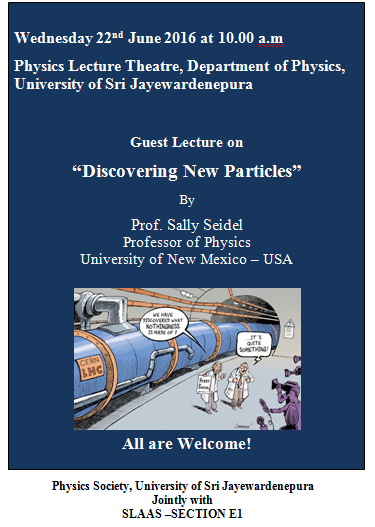 On June 22nd, 2016 there will be a guest lecture on “Discovering New Particles” by Prof. Sally Seidel, Professor of Physics, University of New Mexico, USA. Foundation, the Vietnam Educational Foundation, and the European Commission. Her research has been recognized through Major Research Instrumentation, Career Advancement, and Advanced Detector Research awards. Sally has been a member of the APS Committee on International Freedom of Scientists and the Fermilab Users Executive Committee. She has served on HEPAP and held the positions of Secretary-Treasurer of the APS Topical Group on Hadronic Physics and Chair of the APS Four Corners Section. She is currently Member-at-Large of the Executive Committee of the APS Division of Particles and Fields and a member of the Fermilab Board of Directors. She was for 10 years co-director of the Los Alamos Summer School in Physics, an NSF REU site. She has received three awards for undergraduate teaching or mentorship. Through the New Mexico Visiting Scientist Program she has given talks statewide in K-12 classrooms. She has also given invited presentations in forums on women in science. She enjoys judging the poster session at the UNM symposium on undergraduate research and has hosted a Workshop for High School Physics Teachers at UNM through QuarkNet.